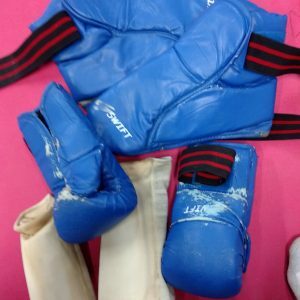 Back in the day, when I was yellow belt (Karate North Gold belt – 8th gup), I started sparring. This was March 1981 or so and a Purple belt (4th gup) lady pulled me aside to spar with her. It ended up that she was tired of being “beat on” by the 15 & 16 year old males in the class. Their lack of control and excessive contact was beyond what she was interested in. So, after a few weeks of sparring with just her, there was a night when she wasn’t present for sparring. 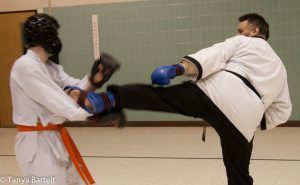 The whole fun of that night is when I ducked under a flying side kick from a fellow student about 4 years my junior. Yeah, he missed as he went over my back, then I punched him in the head. Since that night sparring him and a few others, I’m proud to claim that I fight like a girl. Now why do I put it this way? Because it isn’t a negative thing. It is a way to understand what tools you have and how to use them. I’m not the strongest nor fastest and, if I hadn’t spent the time with her, I probably wouldn’t have continued with Taekwondo. My personality doesn’t fit the aggressiveness of the sport. I’ve been banged on pretty hard by some of the competitors in my sparring division during colored belt days. The sneaky that I learned was the only way that I could keep up with them. Since then, I’ve kept sparring and challenging my students to understand the fight. This work has also helped me develop a better understanding of personal protection and problem solving. I guess where I’m trying to go with this is that, yes, there are many differences between males and females physically, which is basic physiology. Then again, I would rather watch the quality athleticism of women’s college softball and basketball over men’s baseball and basketball. The games are cleaned with more actual playing. I guess I’m good with fighting like a girl. Love it! That is why I went to so many more Gopher Women’s Hockey games than the men, or the Wild. The Gopher women show great skating and amazing teamwork. And back on topic, the person I learned the most from sparring with in BJJ was a woman 1-2 belts ahead of me.